After a marvellous Sunday at Miniatura I can now show you what I bought. The little hinges and fireback were purchased from Sussex Crafts, I can't remember where the books came from and the main two pieces, the spinet, a commission by Masters Miniatures and the candle stand commissioned from Olde Charm Miniatures. 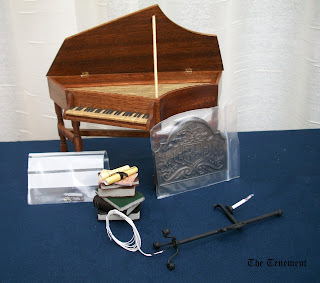 Masters Miniatures already have a spinet in their range but given the amount of space I have to work with in The Tenement, a slightly smaller one was required and they very kindly obliged. It's a lovely piece of furniture. The candle stand was made for to me to fit into the forthcoming Green Room and I'm very pleased with it. Beautiful pieces Irene. I especially love the spinet, it looks so elegant. How clever of you to ask for a commissioned piece in the size you wanted. Saves all that time trying to find the right piece and then settling for something. A knee-hole desk!? Can't wait to see what you create. Good luck with the maths! Oh ... You have made ​​one of my dreams, gaining the harpsichord of masters miniatures: even I will buy it for my Georgian house, is gorgeous! Janice - I'm putting off the maths and I've yet to place the spinet but this should get off the ground next week. Flora - MM have some lovely pieces, especially for your era. Time to get it out of the box! Hi Irene! I meant to come reply sooner! I LOVE your additions to your collection! Every one! I admire anyone who goes to those Miniature Fairs and comes home with EXACTLY the Right stuff.... me... I'm way too impulsive! The Spinnet looks like a work of art! hope this comment gets to you OK! love the treasures you found at miniatura, and your chair!! The spinet looks great. 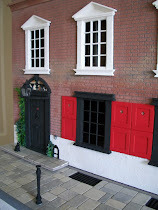 would like something like that in my own dolls house, so will have to start saving!